The Apple Watch has finally been released. After months of waiting, many of us are finally starting to get our hands on them. We will continue to cover this new platform over the next few months, but we wanted to give you a rundown of some apps that we recommend you try on launch day. Overcast is the best podcast client for iOS, and it’s now available on the Apple Watch. The watch app allows you to view all of your unplayed podcasts, play/pause, and control features such as smart speed and voice boost. OmniFocus, our favorite GTD suite of apps, has also gained Apple Watch support. Using the app, you can see what items are past due, due today, and up next. You can also put a custom perspective or specific list on the main screen for easy access in the future, or add items to your inbox, mark tasks as complete, and flag items — all of which will stay in sync with your iPhone app (and the rest of the suite). Wunderlist, our favorite app for shared lists, also released a version of its app with Apple Watch support. You can view your inbox, your items due today, and important to-dos that are assigned to you. You can also use the Digital Crown to quickly scroll through all your lists. Day One, the best journaling app for the Mac and iPhone, has updated its app for Apple watch. It allows you to dictate new notes, view recent entries, and quickly create new journals. 1Password is one of our most used apps here at The Sweet Setup. We were excited to read about Apple Watch support for this app as well, and even though Apple Watch doesn’t have Safari, 1Password is still incredibly useful. It will be great for looking up credit card numbers when on the phone or your neighbor’s alarm code when you are watering their plants while they are on vacation. The Watch functionality requires the $9.99 IAP Pro upgrade. Workflow, The popular iOS automation app, has also added Apple Watch support with its most recent update. There are quite a few things that Watch-enabled workflows can do. This includes sending email, playing playlists, saving information to Dropbox, adding reminders, tracking expenses, and much more. If you run a workflow that needs to be done on the iPhone, Handoff support can transfer it back to the phone. Evernote for Apple Watch includes the ability to dictate notes, perform searches, and see recent content that you’ve worked with. It will also allow you to set reminders and check items off a checklist. Runkeeper, our favorite run tracking app, now has Apple Watch support. It allows you to stop, start, and view stats about your run. You can also keep up with your training plans as well. The popular “save for later” service also has Apple Watch support today. You can trigger text-to-speech directly on your watch, and once you have finished listening, you can delete, archive, or organize the article. The best simple to-do list app makes its appearance on Apple Watch. Clear will not only allow you to view and complete tasks from your wrist, but create them as well using the built-in Dictation capabilities on Apple Watch. Dark Sky is our favorite radar app for iOS, and with Apple Watch, the app’s uncanny ability to predict exactly when precipitation will fall will be a simple tap away. In addition to push notifications about rain or snow in your immediate vicinity, Dark Sky for Apple Watch also includes forecast information. Everyone’s favorite team communication tool can notify you of DMs and mentions through Apple Watch. You can review and dismiss messages, or reply with tappable, pre-written messages. Aeropress, one of our favorite iOS timers, is now compatible with Apple Watch. Instead of needing your phone handy to make coffee, it can be safe and sound in your pocket, out of reach as you plunge that perfect cup. The venerable Twitter app may have the most complex Apple Watch app we’ve seen so far. Its Glance view shows activity from the past 24 hours, but the app also shows your most recent 25 replies, mentions, direct messages, faves, retweets, and new followers. You can dictate a new tweet and even use Handoff to edit it on your iPhone or iPad. The popular IFTTT apps have also enabled Apple Watch functionality. The Do Note app will allow you to quickly dictate notes and send them to the cloud service of your choice.The Do Button app will allow you to quickly interact with other channels such as Nest. Instead of having to manually change your thermostat, you can quickly set it to a certain pre-set temperature from your wrist. Due for Apple Watch will allow you to manage all of your reminders right from your wrist. This will make it extremely easy to start and stop your timers while allowing you to set reminders and check them off. We chose Pinner as our favorite Pinboard app a few months back. With Pinner for Apple Watch, you can check out the popular and recent bookmarks from Pinboard, and you can also search for bookmark tags using dictation and see bookmarks from your network. Curbi is a parental controls service for the iPhone, iPad, and iPod touch. The watch update includes the ability to enable a timeout and to disable active rules. Vigil is a great app for getting push notifications if there are issues with your website loading. 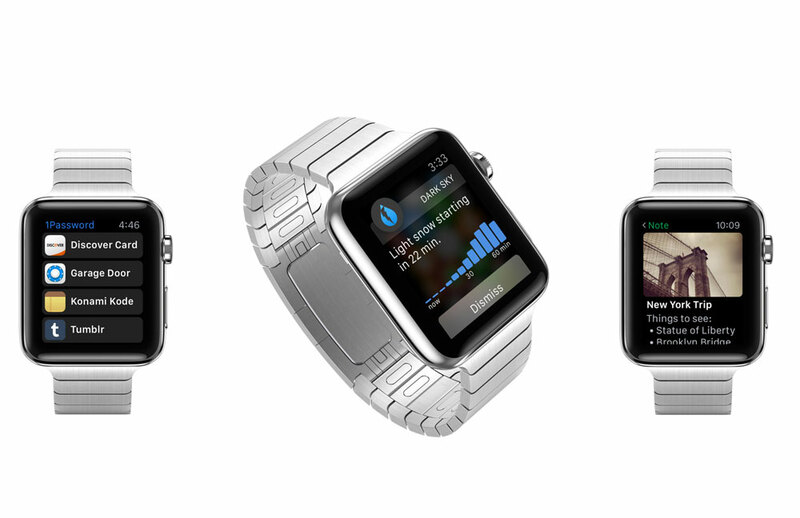 With Apple Watch support, you can now be notified directly on your wrist. Things is another popular GTD application for Mac and iOS. With Apple Watch support in the iPhone app, you can now now quickly glance at you to do list, manage projects, and add items using Siri. Any changes or additions you make are synced immediately back to the iPhone app and the rest of your cloud sync account.